INTRODUCTION: The long length and small diameter of endoscopic working channels present significant design obstacles for instruments such as endoscopic scissors that require reliable function and strong closing force. This study compares the function of four endoscopic shears. 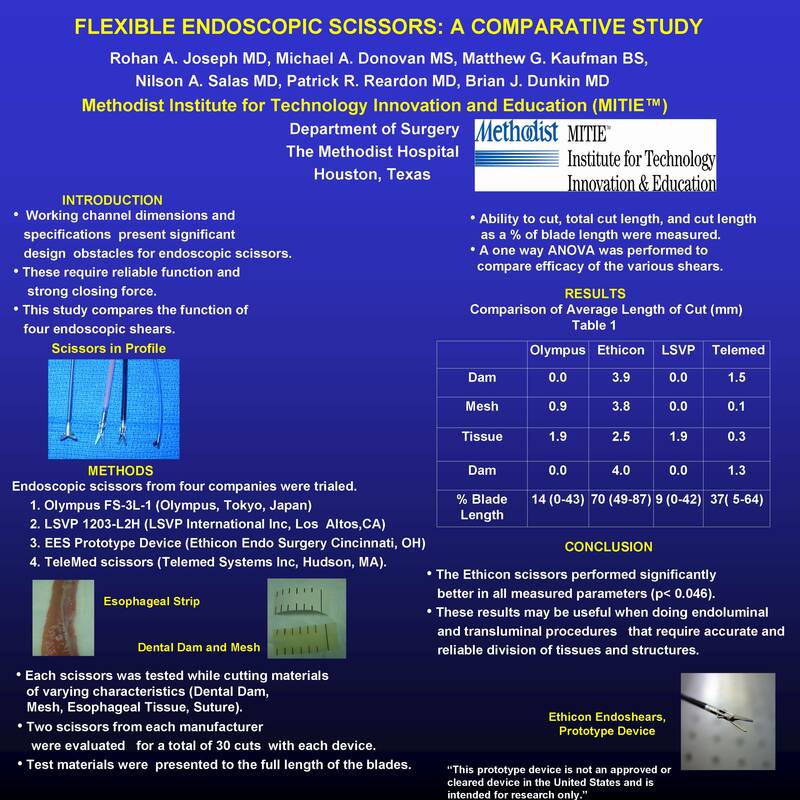 METHODS: Endoscopic scissors from four companies were trialed – the Olympus FS-3L-1 (Olympus, Tokyo, Japan), EES Prototype Device (Ethicon Endo Surgery Cincinnati, OH), LSVP 1203-L2H (LSVP International Inc, Los Altos, CA) and the TeleMed scissors (Telemed Systems Inc, Hudson, MA). Each scissors was tested while cutting materials of varying characteristics (Dental Dam, Mesh, Esophageal Tissue, Suture). Two scissors from each of 4 manufacturers were evaluated for a total of 30 cuts with each device (6 per test material, then 6 more of dental dam to test durability). Each scissor was introduced through a gastroscope and the test material presented to the full length of the blades. Ability to cut the test material, total cut length, and cut length as a % of blade length were measured. A one way ANOVA was performed to compare efficacy of the various shears. CONCLUSION: The Ethicon scissors performed significantly better in all measured parameters (p< 0.046). The comparative performance of these devices may be useful when doing endoluminal and transluminal procedures that require accurate and reliable division of tissues and structures.